Let off some steam, Bennett! We have the latest round of Clear Vision 3 walkthroughs for missions 16 through 20, and for these, you'll want to make sure you have an upgraded rifle with good power and fire rate. In addition, make sure you've got a good scope to match, so you can judge for greater firing distance. For instance, the "lock and load, baby" model is really worthwhile. These shouldn't cost too much, as you'll have plenty of cash from the previous missions from the game. Good luck! There's a bad guy on the corner selling drugs, and someone's getting tired of it, so you're put on the job to take him out. He's wide open on the corner, but there's some distance between you and him. Fortunately, you won't have to worry about wind on this mission, and you won't have to adjust too much to get the long shot off. Just line him up, make slight adjustments for the headshot and take him out. This scoundrel keeps stealing your client's boat and pretending to be a fancy boat captain - so now it's time to send him to Davy Jones' locker. He'll be chatting with a client when you first spot him, but he's hard to miss in his captain's hat. You won't have to worry too much about wind compensation or distance here, just line him up and shoot that stupid cap off his head. Your client really wants to win a photo competition, so he calls on you to take out his opponent. You'll find your target in the park, taking a picture of a local passerby. 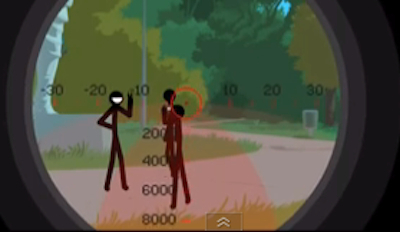 Don't shoot at the guy who's facing him. Instead, point your gun at the one whose back is turned to you, holding the camera. Don't worry too much about wind compensation or distance here, just aim and pop one in the back of his head. NOTE: do not shoot anyone else, or you'll lose your money! Here's where things get really interesting. Karen isn't asking for just one assassination, she wants two. A pair of guys are crossing a bridge from both directions, and it's your job to take them out in one shot. 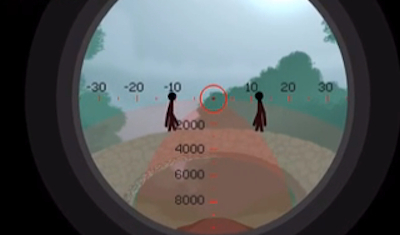 The key here is pointing your rifle scope at the center of the screen, and wait for their heads to cross into the crosshairs at exactly the same time. This may take a couple of tries and cost you some cash in the process, but practice makes perfect, and once you align your shot, you'll be good to go. Here's another tricky mission, only because of a special request from the client - no witnesses. 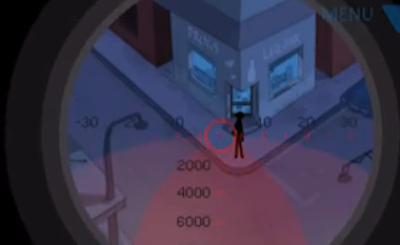 Unfortunately for you, after you pick off your target, there will be a guy crawling into the area. You'll need to act quickly. Go ahead and line up your first shot with your main target, who will be sitting on the left. 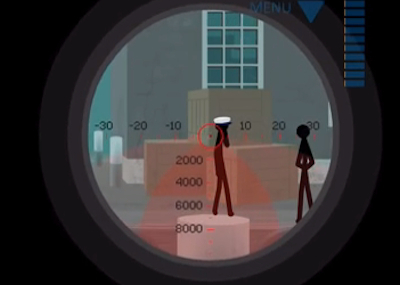 Put a bullet in his head and then watch for the guy that will be crawling out on the right hand side of the screen. 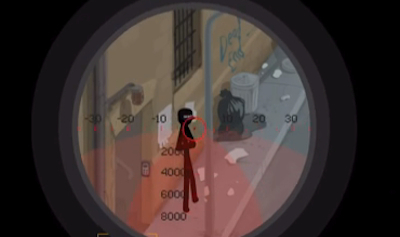 You'll need to shoot him quickly before he sees what you've done, so line him up in your sights.